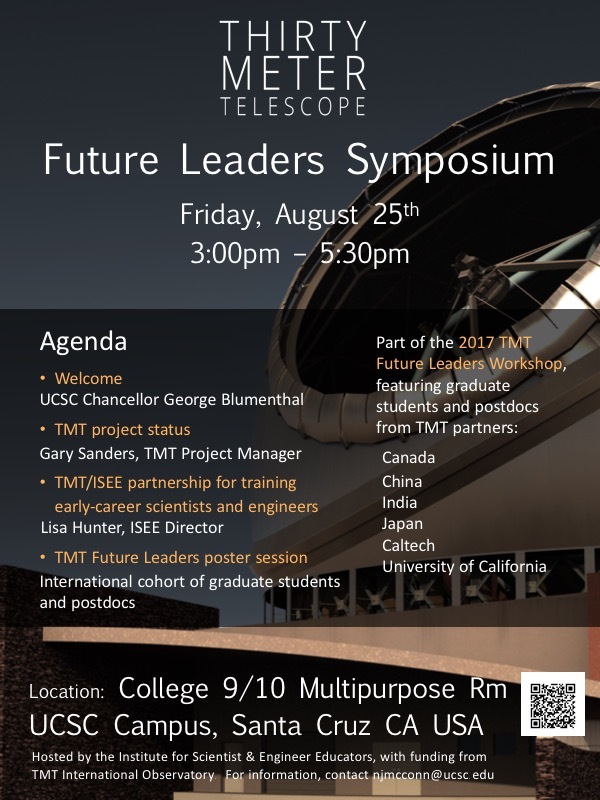 On Friday August 25 we will host the TMT Future Leaders Symposium on the University of California, Santa Cruz (UCSC) campus. This event dovetails with the weeklong TMT Future Leaders workshop and will convene TMT project leaders, our international cohort of workshop participants (grad students and postdocs from TMT partner countries and institutions), and members of the UCSC science and engineering community. The Symposium will feature a TMT status update by TMT Project Manager Gary Sanders and a presentation by ISEE Director Lisa Hunter on training early-career scientists and engineers for productive involvement and leadership with TMT and other telescopes. It will conclude with a poster session, featuring the work of graduate students and postdocs from all six partner countries and institutions in TMT International Observatory. The Symposium is open to all parties interested in TMT or the ISEE/TMT collaboration to train early career scientists and engineers. We welcome Future Leaders workshop participants to contribute a poster showcasing a project they are working on at their home institution or as part of a collaboration. Work advancing science or technology for TMT would be especially relevant to this event. For more information about the Symposium, please see the flyer below and/or contact Nicholas McConnell – njmcconn@ucsc.edu . If you are traveling to Santa Cruz, you may also find relevant information in the Travel and FAQ pages above.